In this third instalment of Hotel Transylvania, young Mavis the vampire is worried about her dad, Dracula. He hasn't been himself lately, and she thinks what he really needs is a break. So she starts plotting a way to make that happen. Ol' Drac is struggling a bit, but not with overwork. Ever since Mavis—the apple of daddy's eye—got married to Johnny and had little Dennis, Dracula's been feeling a little lonely. The long-time widower has love on his mind, even though he tells Mavis, "A zing [true love] only happens once in your life. You have to cherish it." Mavis doesn't know what's been eating at him, but his faithful friends Frank(enstein), Griffin the Invisible Man, Murray the Mummy and Wayne the Werewolf all know what the score is. So they start plotting too, to find their friend a new "zing." That's when Mavis unveils her plans. Her father and the gang are going on vacation: a monster cruise. Dracula is initially unimpressed but his enthusiasm spikes a notch when he spies the ship's captain: a vivacious, energetic woman named Erika. Could it be a second chance at … zing? 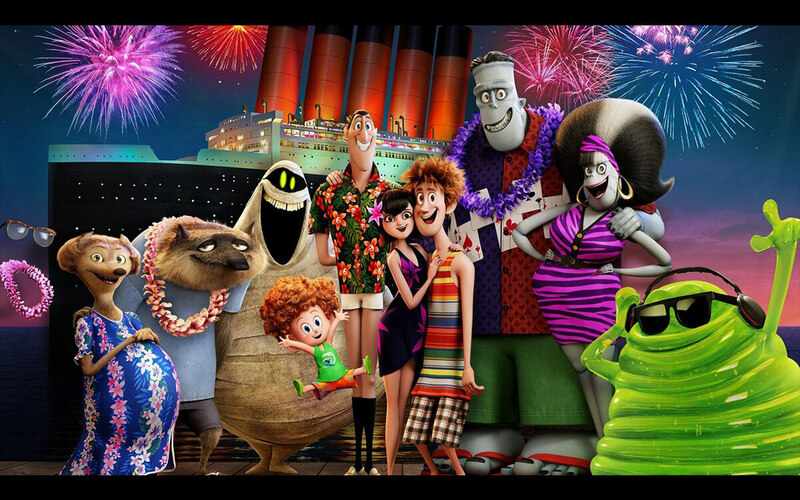 Hotel Transylvania 3 stays true to the movie franchise’s family-friendly roots. Family—including marriage and having children—is presented in a positive, aspirational light. Mavis and Johnny love each other and enjoy raising their son. Meanwhile, Dracula feels the natural void of his daughter growing up, and longs for a second shot at love himself. Erika, for her part, has to overcome some lurking prejudice against vampires and monsters when Dracula starts pursuing her. And Mavis becomes quite protective of her dad as she tries to figure out what's going on. Marriage and parenthood are shown to be challenging at times; but those challenges are small compared to the joy of raising a family with someone you love. The film also suggests that even two people who are very different from each other can still find love. Dracula and Mavis are technically undead beings; a flashback lets us know that Dracula's been around for centuries. Dracula and other characters also exhibit various magical abilities (such as turning into a bat, hypnotising others, and flying on broomsticks). Frank tries to set up Dracula with someone he knows who has "stitches in all the right places." With regard to finding love in the modern age, Frank tells Dracula, "Times have changed: You can even zing on your phone." Dracula makes a profile on the monster dating site "ZINGR," and he sees a witch's profile that includes a photo of her baring just a bit of cleavage. Witches on the cruise wear mildly revealing swimsuits as well. Elsewhere, we hear the double entendre, "Would you like to see my buns?" Winnie, a young werewolf girl, clearly has an innocent crush on Dennis, and kisses him on the cheek. Her parents, meanwhile, make eyes at each other. Most of the violence in the film is harmless, and comical in nature. The first scene of the film is a flashback to 1897, when famed monster hunter Abraham Van Helsing is hunting Dracula and his monster comrades. There is a montage of violent moments with Van Helsing repeatedly getting slammed, dropped and thwarted, cartoon-style, in his efforts to vanquish the monsters. Later in the film, an enormous undersea creature seems to put all the monsters in very real peril and does some damage to the cruise ship in the process. A character throws what appears to be a glass of champagne in Dracula's face. Characters drink cocktails with little umbrellas in them, and a couple of characters get tranquilised. Atlantis is depicted as being very Las Vegas-like. We see characters gambling at various games of chance. Murray slaps someone's backside. Two characters get locked away against their will. [Spoiler Warning] Erika is in fact Abraham Van Helsing's great-grandaughter. The entire cruise has been a ruse to lure the monsters into one location where she and her great-grandfather (who's still alive) can wipe them all out in one fell swoop. She keeps the deception under wraps for much of the movie, though Mavis begins to suspect that Erika may not be what she seems. Hotel Transylvania 3: Summer Vacation isn't a perfect family film, but it's still a sweet one on many levels. The slapstick violence galore and casino scenes don't spoil this sequel's main message: Family relationships and friendships are worth nurturing and embracing fully (and at times taking risks for).